The Chief says he's trained to react without emotion, and says his expression was calm. A community activist claimed the National City Police Chief was smiling at a City Council meeting as she championed for justice for a man killed in police custody last month, and went on a profanity-laced tirade that landed her in jail. Art Fusco, the man who recorded the hostile rant, told NBC 7 the woman, Tasha Williamson, began her allotted public speaking time by demanding answers in the in-custody death of Earl McNeil last month. Williamson also called for the firing of NCPD Chief Manuel Rodriguez and, according to Fusco, refused to leave the podium when the mayor let her know her time was up. 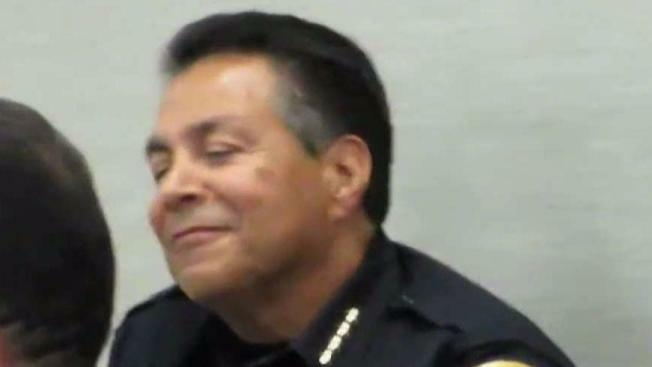 Fusco said when she noticed an alleged wry smile on Chief Rodriguez' face, she lost it. NBC 7's Danielle Radin talks to the family of a man who died Monday after being in National City police custody. “You fire him! He's still smirking! You fire him or he's going to have to resign!” Williamson ordered City Councilmembers. Williamson is an activist representing the group Building Justice and is, according to Fusco, a spokesperson for the McNeil family. Williamson and other activists say Chief Rodriguez had a similar smile on his face during a meeting with the family earlier this week. Activist Art Fusco, who recorded the video Tuesday night, says the chief had the same reaction when Williamson was eventually arrested during the meeting. “His reaction changed from like a normal [frown] to a like a smirk,” Fusco said. “None of this has been funny. So, anybody that says that somehow I'm smirking and laughing about any of this is totally off base,” Chief Rodriguez said after the meeting. Rodriguez argued that he's trained not to react emotionally and that was merely his calm expression as Williamson was arrested. “At no time have I meant to disrespect the family or anybody involved in this,” Rodriguez said. Williamson was released from jail Wednesday and spoke before media outside of the police department. "The way [Rodriguez has treated the McNeil family has not been professional," she said. "He was condescending and very disrespectful to the family." Williamson said she was addressing that topic during Tuesday's meeting when someone mentioned that Rodriguez was allegedly smiling. "I became enraged because somebody's death should not be met with a smile. Somebody's death should not be met with a smirk," she said. "Somebody's death meant something to a lot of somebodies, but not to this police chief." Williamson said Rodriguez' repeated actions, both in interactions with the McNeil family and in not releasing body camera footage of the incident, show his lack of concern. She said her forceful removal from the city council meeting put her in the hospital with physical injuries and increased her blood pressure, and claimed officers laughed at her while she was in her hospital bed and didn't believe she was injured. Williamson also claims she was denied a visit by her lawyer as she laid cuffed to her hospital bed facing questions from police. McNeil, 40, went to National City police looking for help on May 26, according to his family and supporters. He ended up in police custody with bruises, comatose and severe brain damage, his family added. McNeil's family said he was a San Diego resident who suffered from mental illness. He died in the hospital Monday after being in a vegetative state for days with brain damage, the family said. The National City Police Department released a statement saying McNeil called them from outside the police station on May 26. When they came out, he was paranoid and combative. Police said they found a controlled substance on McNeil and attempted to arrest him. Police added they restrained McNeil using a wrap, as they were driving him to the county jail, he stopped breathing. Officers said they called paramedics. McNeil was taken to the hospital, then taken off life support days later. McNeil's family is calling for video of the incident to be released. Williamson claimed Wednesday that Rodriguez determined that his officers played no role in McNeil's death prior to an investigation being completed.